A Crock-Pot is the perfect cooking vehicle for fall-off-the-bone-tender lamb shanks. Lamb shanks are a cut taken from either the shoulder (foreshank) and arm of a lamb, or the upper part of the leg (hind shank). Shanks are full of connective tissue and, as such, are some of the toughest meat on the animal, making them a perfect candidate for long, slow braising to tenderize the tough meat. This lamb shank recipe is flavored with garlic, onions, mushrooms, herbs, red wine and tomatoes. To reduce the fat, refrigerate overnight after cooking, scrape off the congealed fat and reheat before serving. The garlic cloves are extremely mild when cooked whole. If you like a stronger garlic flavor, mince some of the garlic before adding to the crockpot. Spread sliced and separated onion rings on the bottom of Crock-Pot. Rub lamb shanks with Worcestershire sauce, then sprinkle all over with salt and pepper. Heat a heavy skillet over medium-high heat. Add olive oil and brown the lamb shanks. Place browned lamb shanks, along with any browned bits from the skillet, in the Crock-Pot on top of the onions. Top with whole garlic cloves and mushrooms. In a medium bowl, mix together red wine, beef broth, tomatoes, oregano, basil, thyme, allspice, and bay leaf. Pour mixture over the vegetables and lamb shanks. Cook on low for 6 to 8 hours or until tender. Taste and adjust seasoning if necessary. You may wish to make this a day ahead of time and refrigerate. This way you can easily scrape off the excess fat from the gravy before reheating and serving. You can make your own homemade Worcestershire Sauce with this recipe. 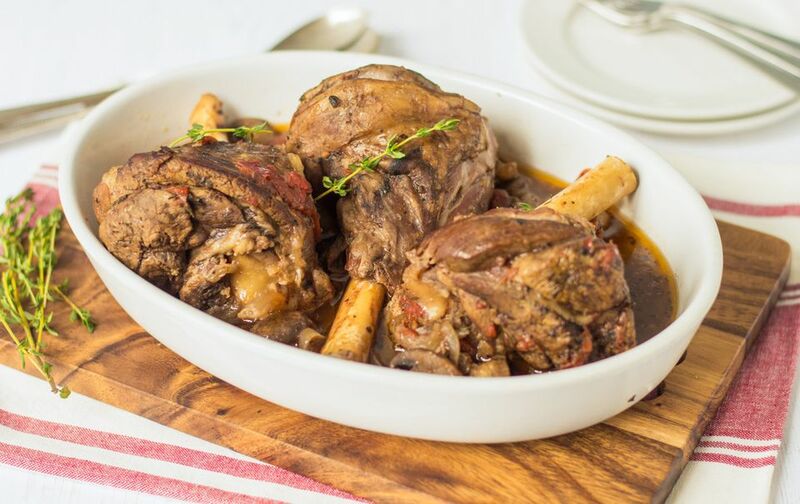 Lamb Shanks Italian-Style Recipe: This recipe serves two but it easily can be doubled. Here, the shanks are braised to tender perfection on the stovetop, not in a Crock-Pot. Lamb Shanks With Portobello Mushrooms and Dried Cranberries Recipe: Lamb shanks are oven braised in this recipe for a hearty dinner that reheats beautifully.